I remember vividly the moment I decided to retire from football. I'd just signed a two-year contract with Tranmere at the age of 30, but had only managed to complete two training sessions in the first three weeks of pre-season, because of long-standing knee problems. I wasn't enjoying it and dreaded the thought of spending two more years icing my knees and plugging away in the gym. We had a friendly against a non-league team and I said to myself that if I couldn't get through the game then I'd retire. Ten minutes in, I ran/limped over to close down a 45-year-old centre-half who was wearing a gum shield! He faked to clear it down the line and cut inside me with the pace of a wounded snail. I tried to turn, my knee locked and I collapsed on the floor. Game over. Confusion, fear, anger, desperation, apprehension. These are just a few of the emotions running through your head when you realise that the only job you've ever wanted, the only life you've ever known, is coming to an end. That phone call to my wife after the game was emotional. She knew how painful football had become for me and that I wasn't happy. Ben Burgess, did you know? Burgess became the first Hull player to score a hat-trick at the KC Stadium, hitting a treble in April 2003, five months after the stadium had opened. 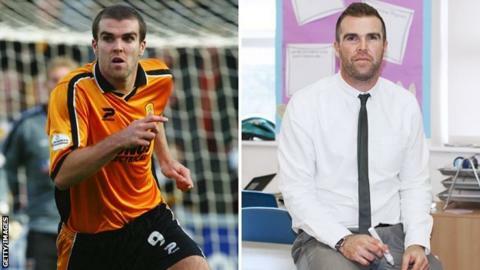 He helped Blackpool to win promotion from League One to the Premier League. Burgess came on at Wembley as the Seasiders beat Cardiff in the Championship play-off final in May 2011. The Seasiders offered him a contract to play in the Premier League but he declined the terms and dropped two divisions to join Notts County. Although born in England, Burgess played twice for the Republic of Ireland's Under-21 team. When I couldn't walk after a game she would often tell me to retire, but she could never have anticipated me giving it all up one month into a two-year contract. We have two young children and mortgages to pay for, how can I pay these without football? Can I continue to support my family as I have always wanted to? I'm only 30, I need to work for at least 30 more years. These are all harrowing thoughts that will enter a footballer's head at some stage. Breaking the news to my manager at the time, Ronnie Moore, that his big summer signing was retiring a few weeks before the season started was one of the hardest acts of all. If I'm perfectly honest, I knew I should never have signed for Tranmere. The moment I was in the secretary's office putting pen to paper should have been a moment of joy and celebration, as it had been when I signed for Blackburn Rovers at 16, or when I signed for Hull City and Blackpool. Instead I felt empty, and inside I wanted to cry. So, I'm standing outside Ronnie Moore's office at Prenton Park, all geared up with the retirement speech I'd rehearsed in my head a hundred times. "Nothing quite compares to scoring a goal, but watching a child finally grasp what you've spent hours teaching them comes pretty close"
"The gaffer won't be in until 11, he's got a meeting," one of the scouts informed me. Ninety minutes later I finally had my audience with Ronnie. "What's up big man?" he boomed at me. "I'm afraid I'm going to have to retire boss," I squeaked (not quite believing the words myself). "Don't be silly," was the reply. "What are you going to do without football?" "I've got a couple of ideas," I said a bit more forcefully. "You're not quitting. Go home and have a think and I'll see you in a few days." I managed to stay strong and finally convinced Ronnie to let me retire. Saying goodbye to the lads who I'd only known a couple of weeks had me close to tears. It was more the thought of never being in a changing room again, never scoring a goal again, never having that banter again, more than missing anyone in particular. I've played and loved football from the moment I could walk, just like most other players, but I'd reached a point where I'd had enough of the beautiful game and wanted a complete break from it. Friends and colleagues all presumed I'd go into coaching but that's the last thing I wanted. It appears to me that all players seem to sleepwalk into coaching after retirement, as though it's already been decided for them and they have no choice. Some do make great coaches but others wait and wait for a job to magically appear and slowly see their savings disappear. All footballers need to realise that there is so much to achieve and enjoy outside of the "football bubble" we have been cocooned in all our lives. I recall receiving hundreds of texts and phone calls from friends and team-mates wishing me well, but also enquiring about my sanity. Why quit when you've got a contract? You will regret it. Just see out your contract. Too late, my mind was made up. To play professional football you need to have more skills and strengths than people give us credit for. Determination, leadership skills, ability to work in a team, performance under pressure, focus and adaptability... just some of the unique skills we all possess that are transferable to the outside world. What employer would not want an employee with those credentials on their CV? While still playing I took advantage of the Professional Footballers' Association's fantastic range of vocational and educational courses. I completed a degree in Professional Sports Writing and Broadcasting at Staffordshire University. This was followed by some radio commentary with the BBC and a few articles for sports magazines. A future in journalism did appeal to me but I had my heart set on becoming a teacher. A month after retiring, I started to study for a Post Graduate Certificate in Education (PGCE). This intense one-year course leads to qualified teacher status. "Teaching won't pay the bills," I was repeatedly informed by family and friends, and I did fear that I could spend a year training and still not get a job. I wasn't a wild footballer with flashy clothes and cars. I had invested well and, as my wife is a self-employed graphic designer, I was in a position to take a year out without it affecting our family finances too much. There's no doubt that my current wage is only a fraction of previous salaries. But I'm supporting my family, I've created a whole new career and there is a clear path of progression that will hopefully see my salary increase. Later that year I had to start going for interviews. Sat in a waiting room, amongst nervous 22-year-olds, a decade their senior, all competing for the same job. I was able to put things into perspective. I'd played at Wembley in front of 80,000 people, I'd taken penalties live on TV, I'd been verbally abused by thousands of fans (some were my own), so why should I be nervous about sitting in front of a panel of five people or teaching in front of a class of 35 eight-year-olds? I was successful in the first interview and have just completed my first year as a teacher. Just like football there's been ups and downs. I've had goals to achieve, I've had pressure on me, I've dealt with an intimidating crowd (of eight-year-olds). Most of all, though, I've had a really enjoyable year where each day is different. The changing room has been replaced by a staff room full of women, but the banter is still there, albeit with less swearing and no look-a-likes pinned above their seat. Other teachers have accepted me, even though a couple were booing 'The Bird Man' (my nickname because of my flapping arms celebration) from the stands a couple of years ago, for the majority I'm just Ben. Nothing quite compares to scoring a goal, but watching a child finally grasp what you've spent hours teaching them, or to watch a boy who hates reading pick up a book and talk passionately about it, comes pretty close. In football I was ambitious and determined to be the best player I could. In teaching I have the same ambitions. I want to climb the ladder to be a headmaster. Do I miss football? Not anywhere near as much as I thought I would. I spend fun-packed weekends with my children. I don't spend all Sunday and Monday limping around with ice strapped to my knees. What has surprised me though is the distance that I have become estranged from former team-mates. Whenever I speak to ex-team-mates/current players they really struggle to even contemplate that I'm doing something outside of football. They don't enquire about my 'new' life. All talk just reverts back to the changing room or other football-related chat that only a few years ago I would be spouting myself. I chose a different path, one that works for me. I understand everyone has different ideas and dreams but I'd just advise footballers to keep an open mind. So when that moment comes for a footballer to think about retirement, there are many transferable skills, which would be an asset to an employer. Instead of being paralysed by fear and apprehension, hopefully they will feel excitement and a sense of opportunity at the next stage of their working life, which could well be until they are 68.